Four Floor Fillers (try say that one after a few shandies) by Irish producer, Conny. 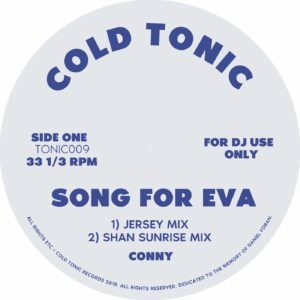 Making his Cold Tonic debut Tipping the hat to good solid chunky house from Jersey towards the opposite side of the two rivers with rave synth-piano breakbeat madness thrown inspired for a brooklyn rave. Each side gets full club-decor by the one and only club beat maestro, Running back's SHAN who offers a punchy sunrise mix perfect for the winter blues and a hard hitting peak time club mix.